There's no party like a vintage party! Here are a few ideas you can try to make your vintage themed bash a blast! If you want to organize a fun, meaningful, and successful event, these 5 tips will help guide you in that goal while riding stylishly in a classic car. The starting point of having a voguish and ultra-modern wedding that everyone will remember is renting a Rolls Royce that will take the audience breath away. These 4 incredible moments had all something in common. The vintage wedding cars took our breath away. FInd out which moments. Ready to take that road trip of a lifetime? With a classic muscle car rental, you can get an unforgettable experience that will last a lifetime. Nothing beats escaping the hustle and bustle of the LA smog and traffic and heading either up the coast or into the mountains. There is no better way to do that than with your own classic cars. LA has some of the best scenic drives out there. For your next weekend getaway, be sure to check out one of our fantastic vintage cars for rent. Whether you want a throaty muscle car or a smooth lowrider we have what you are looking for. Here are our top 5 vintage cars for rent from our LA inventory. Nothing says classic California style than the Beach Buggy. This thing looks fun even just sitting there! These vintage cars for rent are the perfect beach mobile and fit two surfboards on the roof so exactly what you need to take up the coast to Malibu and really hit the waves in style. What better way is there to enjoy that year-round perfect California weather! For some many kids, the El Dorado was the dream car growing up. It has style, smoothness and a deceptively powerful engine under the hood. This convertible is from the peak era of El Dorados so it is the perfect blend of fun, function, and utility. You can cruise up and down the coast and has enough muscle to squeeze around some truck on those tight mountain roads. Certain brands are defined by one model in particular. For Porsche that is the 911 Carrera. This is a vintage car that has changed so little that even the current model hardly differs from its vintage brethren. If you looking to get out of town and do it fast, then there is the car for you. Its six-speed manual transmission is just begging for you to do a little power shifting through the mountains just north of Los Angeles. When it comes to vintage cars for rent the Ford Thunderbird is truly the iconic California car. From classic movies to the streets of Santa Monica, you can still see their style brightening up the California motorways. They are large, spacious, and absolutely comfortable. There is also just something so unique about driving such a piece of American automotive history. It a must-drive on any vintage car enthusiast's list. This is one of the newer cars in our inventory, but it is because it is such a rare gem in regards to vintage cars for rent. Not all of us are looking for that smooth ride down the coast. Some of us are looking for a little adventure and there is no better way to find that than in this classic Land Rover Defender. It is ready for some fun out there. Best of all, it still is a convertible so you can really get the wind in your hair. Los Angeles is one of the top Vinty locations. These five excellent vintage cars for rent are just a drop in the bucket of the excellent selection we have. So check out our inventory and choose one of our perfect vintage cars and plan an unforgettable getaway! These days, companies are getting more and more creative with their corporate incentives. In the past, maybe it was a steak dinner or weekend getaway, but if you really want to both motivate and reward your team, then it times to start thinking outside of the box. Classic cars are the perfect corporate event party prop, gift, and incentive. Here are the top five reasons why classic car rentals make the perfect corporate incentive. Most cars these days look and drive quite similar. Yes, a BMW might be faster than a Honda, but as far as features like touch screens, navigations, and other older things we now take for granted like power windows and steering, nearly every car on the market features them. From the way they drive to the way they look, classic cars have their own unique feeling each time you get behind the wheel. Most people grow up loving the style of a classic Mustang or Mercedes, but never actually have the chance to drive one. There is simply not a lot of them out there anymore. Those that do work are often parts of museum collections or some person’s restored pride and joy. It’s one of those things where it’s not just a matter of money, but who you know whether you can drive one. People always appreciate receiving bonuses, but driving around a few days in a classic car is a good way to visibly show appreciation for a certain employee or group of them. Plus, it can serve as motivation for other employees to work hard and achieve certain targets. These days the general consensus is that spending money on experiences instead of things is the real secret to happiness. Even if they just take the classic car rental for a short road trip to Joshua Tree, driving a classic automobile transforms the daily drive into something special that they don’t have the opportunity to do too often. Every person has their own dream car and there are many different types of classic cars. For some it something fast like a classic Corvette, others want to drive powerful muscles cars like a Dodge Charger while others might be looking for a lowrider. Since everybody has their own style give them the opportunity to choose themselves. It will give them that additional motivation they need to really do an excellent job and hit those targets that you are looking for. If you are looking for something special so that you can push your team to the next level then reward them with a classic car rental. There is no better way to show your appreciation than giving them the chance to drive the car of their dreams. The sheer joy of riding in a classic auto escapes mere words. You have to travel in one for a distance and let the atmosphere and history course through your veins. That said, most older cars can be a little tricky, especially when they have been around for decades. Hence, we recommend a chauffeured car service, particularly for your wedding classic car rental and other special events. Having a chauffeur at the wheel means everyone in the party can relax and enjoy the ride. Another advantage of a chauffeured car service means the driver - often the owner - knows the car. If there’s a small problem with the vehicle somewhere, the car chauffeur knows how to fix it. A driver attached to a chauffeur car service knows how to provide the smoothest and quietest drive possible. Moreover, a chauffeured car service driver is responsible for returning the classic car to its owner, in the same spotlessly clean condition as when it went out. Most folks hire a classic car from Vinty because they have an occasion to celebrate, and want to attend the fun event. This could be a birthday, an engagement, a wedding, or the occasion of a promotion. A bit of bubbly - and more - often flows on such occasions making it difficult to get behind the wheel. A chauffeured car service means everybody can join in the fun and let their hair down the way they want. Don’t let being sensible spoil your day or make you the odd person out. Vinty and celebrations are a perfect match for each other. Like love and marriage, Vinty and celebrations go together. In fact, many of our vintage and classic car owners insist on including a chauffeured car service as part of the deal. The love for their cars is absolute and they never want to let them out their hands. The auto insurer may also insist on a chauffeur, because of the unusual mechanicals that takes getting used to. Wedding guests especially like to gather around a Vinty car after the main celebration is over. They want to know more about the vehicle, its history, and reasons why it is a classic. Who better to tell its story than the owner who is part of the tale? You honestly cannot substitute the real thing with a piece of paper. We take care of everything for you at Vinty. We are the service that puts classic cars within your reach. We hand pick our vehicles and choose their owners carefully to make sure they deliver you, our customer, a seamless chauffeured car service every time. Don’t take chances with arrangements for your special occasion. Let Vinty take your worries away so you can enjoy the celebration of a lifetime. It just makes more sense to do things that way. Contact us to learn more about our rentals! If you want to make your wedding stand, having a wedding classic car rental is one sure-fire way of making it happen. It begins with finding a reputable vintage car rental company with a good variety of autos. You and your partner probably have an idea of the classic vehicle model you want for the day. This article presents six things you should know. Simply the Best - Wedding classic car rental is quite different to hiring a car after arriving at your holiday or business destination. Renting a vintage car will definitely make your wedding day unique. This classic and unusual transport from the past lets you and your partner-to-be make an impressive entrance on a memorable occasion. Continue reading, as we consider other important pointers to the perfect wedding day. Do the Research - You definitely do not want your wedding classic car rental remembered for the wrong reasons! Choosing a reputable vintage car rental company with an impressive record of accomplishment is important in avoiding a disappointing rollout on your special day. If you want complete peace of mind, make use of an online facility like the Better Business Bureau (BBB) - click here for the link. The Sooner you Book the Better - Now that you have found the right company to rent a vintage ride from, secure and confirm your booking as soon as possible. This may mean up to a year before your wedding. Legalities - Booking your wedding classic car rental does involve legal formalities, no surprise there. If they do not offer insurance cover, you have to ask why. Consider the fallout from roadside incidents, even if you were not driving, because you signed the agreement. The bottom line is choosing a bona fide operator that has all bases covered. You can also benefit greatly from wedding insurance. Two’s Company, Apart from the Driver– Typically, your wedding classic car rental is for two persons only, why would you want more. Liability issues mean you probably will not get to drive the vintage car. The solution is in using a uniformed chauffeur. This adds tremendous value to your special event. Know What You Are Entering Into - We recommend that you carefully inspect your chosen vehicle’s condition before signing any agreement. Include body, chassis, engine, and suspension in the check. Look at the air-conditioner as well as lights, windows, and doors. Is the interior to your liking? When arranging your wedding classic car rental, you may want to consider hiring a classic car for invited guests. Your car is for you and your partner, not forgetting your debonair chauffeur of course! We all have to work within a budget, so know what you are signing up for before putting pen to paper. Watch for hidden extras in your quotes. Ask about driver gratuities. In general, wedding rental companies propose a gratuity of 15 to 20 percent of the hiring cost. You can pay this directly to the chauffeur or have it added to the invoice. All that remains is to wish you an exquisite day, and please make the most of your wedding classic car rental! Joshua Tree National Park is a trendy place where two deserts meet and folk stream from San Diego to weekends to overnight in six airstream trailers painted psychedelic colors. They also have a collection of bungalows dating from the 1920’s, and a Wild West movie set turned into a honky-tonk bar. Your old classic car rental from Vinty will feel right at home among like-minded folk like these. Every old classic car rental from Vinty is in first-rate condition. It will readily eat up the 160 miles on Highway 62. Best allow three hours for the trip if the road is busy, otherwise, you can shave thirty minutes off your schedule. Depending on whether you are planning to just stop by, overnight, or camp we have great choices of old classic car rental day trippers, overnight convertibles, and camper vans if you want to take the frame tent and folding dining table. Highway 62 is in superb condition and invites you to pump the throttle if you are planning to do the round trip in one day. It can also get quite warm in the open spaces where the Mojave and Colorado Deserts meet so you are going to need wide opening windows too. Do you fancy a 1970 Buick Electra in fire engine red with all the trimmings? In its heyday, this old classic car rental had all the extras. When the Brits launched their MG MGB Roadster in 1969, the US market snapped up most of the production. This old classic car rental in canary yellow is one of our favorites for an overnight at Joshua Tree National Park. One of those 1920’s bungalows will set it off to perfection. And when you drive up to the honky-tonk, the country and western may stop playing for a moment, while the band streams out to look. The surreal features, ancient history and wide-open spaces of Joshua Park invite you to sleep under the stars in one of nine campgrounds with facilities provided. It’s a hard choice although a 1985 Volkswagen Vanagon Westphalia with pop-up roof and electrical and water hookups might do the job just fine. We have several older classic car rental campervans to choose from. Joshua Tree National Park has paved roads to all the main attractions, and the going is easy and level between the mighty rock formations. A myriad of natural attractions invites you to visit them with windows open and hood down if you can. A modern auto with air-conditioner filters destroys the sweet natural aromas of the wilderness around you. However, an old classic car rental from Vinty with a loving owner makes a drive through Joshua Park remind us how the place looked in 1936 and we can sense the goodness all around us. President Roosevelt declared it a National Monument in that year and they all drove what would become classic cars. In case you were not aware of it, the era of internal combustion engines – both diesel and petrol versions – is drawing to a close. In the not too distant future, it seems we will be captive passengers in self-driven electric vehicles. This is quite a change to take in and many will rue the day they lose their freedom to drive as they please. Looking longer term, imagine the scarcity factor when looking for a vehicle from years past for your classic car photoshoot or special event. No problem at Vinty, because we always have a solution. Renting classic and vintage cars is our core business and we fully intend to keep on trucking. The interest in our vehicle collection is huge and ranges from weddings to photoshoots and movie sets using our one-of-a-kind classic – and vintage – cars. No need to panic, because there will always be a place for the legendary vehicles that have been with us since Henry Ford introduced the first Model T Ford, alias ‘Tin Lizzy’. Most American towns and cities have museums dedicated to our rich legacy of motoring history. The interest in automobiles from the past will always be around. We pride ourselves in making it happen out there on our roads and highways. We also plan to continue expanding our magnificent collection of classic and vintage autos to keep our adoring clients happy. It all starts with choosing the vintage car that best suits your theme for the classic car photoshoot you have in mind. The list is as long as it is impressive, so you are going to face some tough decisions. If you want to add a magic touch to your photoshoot, renting one of our classic cars will certainly guarantee you that. If you are bold, you could even choose from our impressive collection of vintage cars. Visualize the glamour that arrives with a classic Mercedes or the competitive edge a Pontiac Firebird brings to the party. If your classic car photoshoot is family-themed, what better than a 1970’s VW camper for enhancing your magic photos! OK, so you have chosen your preferred vehicle for your classic car photoshoot, and have wisely decided to use our driver, you are off to a good start. Time to figure just where you plan to shoot your photos, and you have many excellent opportunities - be sure to speak to your chauffeur. Great locations lend themselves to the story and help bring out the best in you and your camera. No classic car photoshoot would be complete without the magnificent wheels on hire from Vinty. If you are planning a classic car photoshoot of the editorial variety, you probably want it selected by a magazine. With this in mind, put your classic car rental to good use, and remember not to shoot too many landscape images – rather keep your camera in portrait mode. This is because magazines roll off the production line in pages, so portrait framing works well for them. Ready to rock and roll! Have you been tasked with setting up your office’s corporate party? Whether it’s the annual Holiday Party or a spookalicious Halloween Bash, or a farewell party for a colleague, you can never go wrong with setting up a photo-booth. Give your work-weary colleagues a chance to let their goofy selves out to play by setting up a booth with creative props and accessories that your colleagues can mess around with, while hamming it up for the camera. Trust us: nothing builds team camaraderie as well as an opportunity to go completely nuts and have fun doing it. From simple to completely outrageous, there’s no limit to the ways in which you can turn the usual office shindig into one that will have your colleagues talking about for the rest of the year (and then task you again with repeating the experience). No photo booth experience is worth salt without a variety of headgear that your colleagues can plop on their noggins. Depending on the party you’re holding - for instance, if it’s the Christmas/Holiday party - the standard props associated with the holiday are pretty much a given; like reindeer headbands, elf hats, and Santa hats. But where would be the fun in sticking with the traditional? Luckily, there are hundreds - nay, thousands - of choices you can go with: Viking horns, Liberty crowns, clown toupees, sombreros, pirate bandannas, wizard hats … well, you get the idea. Photo frames are yet another staple prop in any photo-booth. You can either create your own custom frames (if you can spare the time to do it) or buy them online. You can go with anything from antique photo-frames or modern-day frames like an Instagram post photo-frame or face cut-outs that your colleagues can frame themselves in. For a unique spin, you can creatadobese in. Find out if they’re OK with it, though: in all probability, they’ll be flattered. But, still. Ask. Induce the silly in your colleagues by supplying them with a whole range of eye wear like geek glasses, steampunk glasses, glasses that make their eyes look ginormous, or oversized glass frames. Glasses can make even the most serious people look sufficiently goofy. Indulge the geeks in your office with themed eyewear from popular franchises they’re bound to love: from the unique styles of famous celebs like Elvis Presley to those worn by characters from their favorite fandoms like Harry Potter. Everyone loves to play-act: especially if they can pretend they’re from a different time in history when people let their fists and weapons do the talking. Fake guns, swords, hammers and other violent paraphernalia can make for some truly creative photos, as your colleagues attempt to enact various scenes using those props. Step out of the box and turn your photo-booth experience into one that will have your colleagues talking about it for a long, long time. Liven up your event with unique props that are literally from a different era in time. Like a vintage car. You can hire a vintage car from Drive Vinty to add a special flair to your event: from retro American models to classic European roadsters, your colleagues will have a grand ol’ time with these. You can supplement the experience with time-appropriate props for the era the cars come from. Who said themed costumes and props are to be limited to Halloween or Comic-Con? Themed parties dedicated to specific fandoms and franchises are in and here to stay. And, today you’ll be hard-pressed to find anyone who’s not part of one: whether it’s Game of Thrones, LoTR, Harry Potter, and a bazillion others. Stock the booth with a variety of props from various franchises, and watch your colleagues have fun recreating specific scenes from their favorite books or series. Setting up and hosting a corporate party or event doesn’t have to be a chore: it’s just a matter of providing your colleagues a means to let their hair down and let go of their professional selves. And nothing can serve that purpose better than a photo-booth or station with carefully chosen props, vintage cars, and more. Planning a wedding is hard. There’s a lot of pressure when you’re trying to plan the perfect day. Most of the details get taken care of months in advance. One is often overlooked, and it’s a shame because it’s a missed opportunity to make your special day memorable, classy, and unique. Vintage wedding transportation is the perfect finishing touch on an otherwise impeccably planned day. The Honeymoon Departure: One of the best photo opportunities at a wedding is that great image of the bride and groom leaving the party to embark on their wonderful life adventure. That picture will be prominent in the album and displayed forever. It’s a simple shot; just two joyful people and a car. The faces are predetermined but which car represents the start of your journey is entirely up to you. Vintage wedding transportation from Vinty makes the moment special, bringing a touch of class, a sense of style, and a unique experience for everyone involved. Bring Guests to Special Venues with a Touch of Class: More and more brides and grooms are choosing venues off the beaten path for their nuptials. Amazing fields filled with wildflowers. Ceremonies on the sand in front of crashing waves and amazing sunsets. These are great choices, but parking may be limited. Wouldn’t it be incredible if a fleet of vintage vehicles ferried your guests from the off-site lot? You know the attendees will remember the event and be impressed with your thoughtfulness and attention to detail. Vintage Wedding Transportation from Ceremony to Reception: If your ceremony and reception are in two separate places, the logistics of moving the crowd from one to another can be daunting. Let Vinty solve your problem. We will provide a fleet of vintage wedding transportation options sure to satisfy any theme or style. Our service makes your wedding stand out from the crowd with a memorable experience for everyone involved. Bachelor/Bachelorette Party Stylish Rides: On your final night of being single you want to let it all hang out. It’s time to celebrate with your closest friends and spend some time reminiscing about the past and dreaming of the future. Bring a touch of class to the event with a vintage wedding transportation rental. It fits the theme, makes a statement, and we even provide a chauffeur, so you don’t have to worry about a thing. Classic Rehearsal Dinner Options: Want to make a big impression on the in-laws? How about arranging for your bride’s father to be picked up from the hotel in his favorite car of all time? That just might do the trick. Vinty has a large assortment of classic vehicles available to rent for occasions of all kinds. We’ll help you score as many points as possible, in case you need them later. It’s your wedding day! Make it as memorable as you can. Choosing vintage wedding transportation by Vinty makes your special time an occasion to remember. Our great selection of classic automobiles and helpful staff will work with you to ensure the perfect fit for your event. You’re getting married. Do it in style. There are many classic car styles out there, but sometimes knowing which one is the right option can be a difficult choice to make. We don’t know your drivers, but we do know what drives people our way in Southern California. Decisions are usually clear-cut, impulsive, with emotion, and based on fond memories adding greatly to the excitement around the decision of which classic car style is going to work best. Join us as we take a look behind the scenes; this way, your decision will be a lot easier. Awesome Choice for Car Rental 101 – Which Classic Style is Right for You? Fancy making a grand entry in a 1965 Ford Mustang Fastback – let’s go! Classic Trucks - you saw right! Legendary cars, within reach! This is our motto here at Vinty, where we make premier classic car rental experiences come true. We have a car collection you will love, including unique classic cars that you thought were the stuff of dreams. Read on if you want to convert that dream into reality, an experience that will stay with you forever. Two words eloquently describe our fleet offering: Exceptional Vehicles! We know we are bragging, but we do know that we are going to exceed your wildest expectations when you choose from the classic car styles from Drivevinty. Remember to look at the body type you prefer - for example, Convertible, Sedan or Limo. No problem if you prefer automatic transmission to manual. Choosing the classic car style to suit your needs is the only difficult part! Who doesn’t love classic cars? They have a unique thrill that can’t be found even in today’s most expensive, ultra sleek driving machines. That said, they can get pricey fast. For this reason, many enthusiasts turn to rebuilding vintage cars themselves. Not only is it a great hobby, but it is a fantastic way to really know what goes into one of these great roadsters. This short guide is going to give you the basics on restoring a classic car so you are ready to get in the garage and start and working to create your dream ride! This is somehow the easiest and most difficult thing to do. There are so many great choices out there. Do you choose a 1966 Ford Mustang or a classic Porsche? 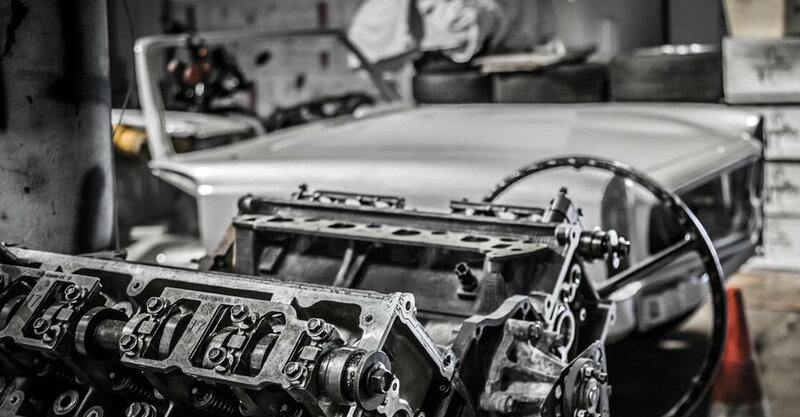 Even if you are ready to work around the clock to rebuild your car, it is going to take some time so choose wisely. The best thing you can do is rent some different vintage rides and see which one you like driving best. Remember, the way it looks is important, but you also need to love the way it drives! When you plan on restoring a classic car, you are obviously not looking for something in perfect shape. That’s how you are going to get a sweet price on it! However, you are going to have a threshold of how much work you want to do. Do you want from near scratch with mostly just an old frame on wheels or do you want to do just a quick tune up and paint something? How much rust is on the body? Does the car run on its own? What kind of repairs and modifications have been made? What’s operational and what isn’t? Why is the person selling it? The last question is particularly important. Some people just find old cars to resell to collectors while others just want to get rid of something that may have been sitting around their house too long. Either way, this last question can help you answer a lot of the others! Depending on the state of the car, the restoration process can take anywhere from weeks to months. You have to be ready to put the time in. Fortunately, there are loads of YouTube videos on restoring just about any car. You also need to make sure you have the right tools. This is where doing your homework is important because certain makes may require certain tools that you may not have in your collection or may have to custom order. eBay is a great resource for all things classic car and more than anything, go to forums. Finally, there are forums for all kinds of cars and you can find all the information you will ever need about whatever auto you choose, along with its peculiarities and how to fix any issues it may have. There is no greater feeling than cruising along in your restored vintage car. The work you put into it will create a special relationship that you will be able to truly cherish. So get on the Internet and find the best car for you to start working on today!